The fold-able dual foil blue eyes car sun shade will make your car look and feel like the coolest place to be on the hottest day. 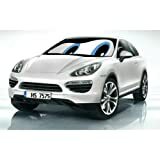 Add playful charm to your car’s decor and make it an instant hit with the kids as the blue eyes bring your car to life. The foil material is treated with UV protection to keep your car’s interior and contents away from the sun’s harmful rays while the spun bond finish on its edges makes it more durable.